In my opinion there’s nothing that elevates a dish quite like fresh herbs; cooling mint with a spicy curried lamb, peppery basil with fresh tomatoes & mozzarella and savoury dill with salmon. Parsley is often seen as the most common of the herbs, and perhaps a little boring, but one shouldn’t underestimate this awesome plant. – One of the highest foods in vitamin C: 130 mg per 100g – to put this in perspective, a grapefruit has 30 mg per 100g! 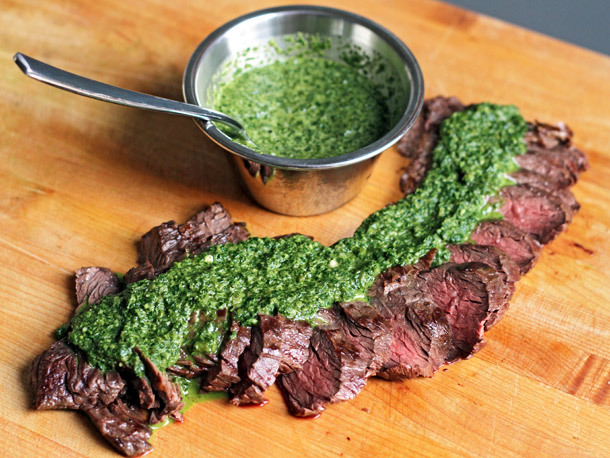 Next time you reach for the blue cheese or a buttery béarnaise sauce to pair with your steak, give chimichurri a try instead – it’s healthy, easy-to-make and delicious – enjoy! Combine all ingredients in a food processor and serve as a dipping sauce for BBQ’d steak.